His Utica office and his Binghamton office collected more than 200 cards from individuals in schools across the 22nd Congressional District. Much more with the congressman tonight on the live at five newshour and newschannel 2 at six. It was valentine's day all over again today for some in new hartford. 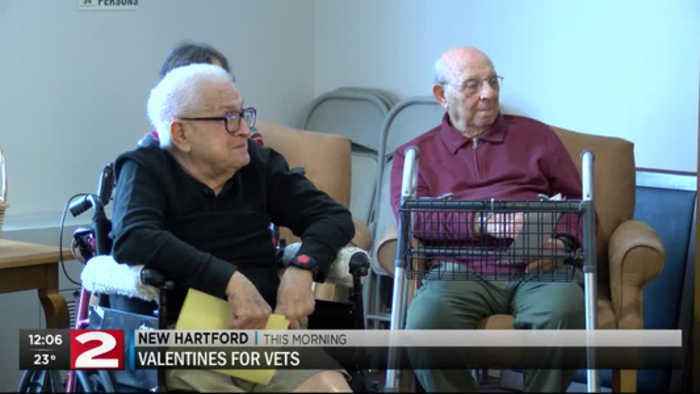 That's because congressman anthony brindusi delivered valentines to the veterans who are currently at sitrin's cedarbrook assisted living complex. This is part of brindusis 'valentine's for vets program'. His utica office and his binghamton office collected more than 200 cards from individuals in schools across the 22nd congressional district tc : 48:37 "definitely a great thing, a great thing a lot of people having a great time." Tc : 50:15 "and i'll have these, i'll put them up, i got them on my window at my place right downstairs." Tc : 53:47 "when you talk to them and hear some other stories and you can see that they appreciate someone taking notice of the sacrifices that they have made during their service and this is just a small token of our appreciation and the school children appreciation for the sacrifices all of our veterans have made."